Figure 1: Sketch of basal ganglia pathways that contribute to the execution and suppression of actions (from Schmidt et al., 2013). STR: striatum; SNr: substantia nigra (pars reticulata); STN: subthalamic nucleus. Inhibitory control allows us to quickly suppress actions. This can mean resisting a tasty dessert, withholding an angry reply, or stopping to bite into apple when we notice a wasp sitting on it. We are interested in how basal ganglia circuits are involved in the stopping of actions. It is important to understand how inhibitory control works in the brain because if it is impaired it has usually devastating consequences for us. For example, Parkinson’s disease, drug abuse, and motor tics in Tourette Syndrome can reflect different aspects of impaired inhibitory control. In previous work we studied neural activity in multiple basal ganglia structures in rats performing a stop-signal task (Schmidt et al., 2013). Subthalamic nucleus neurons showed low latency responses to Stop cues, irrespective of whether actions were successfully canceled or not. By contrast, neurons downstream in the substantia nigra (pars reticulata) responded to Stop cues only when actions were successfully suppressed. Remarkably, nigral neurons with fast Stop cue responses formed a functionally-defined ‘hotspot’ that corresponds to the anatomically-defined nigral “dorsolateral core” region. 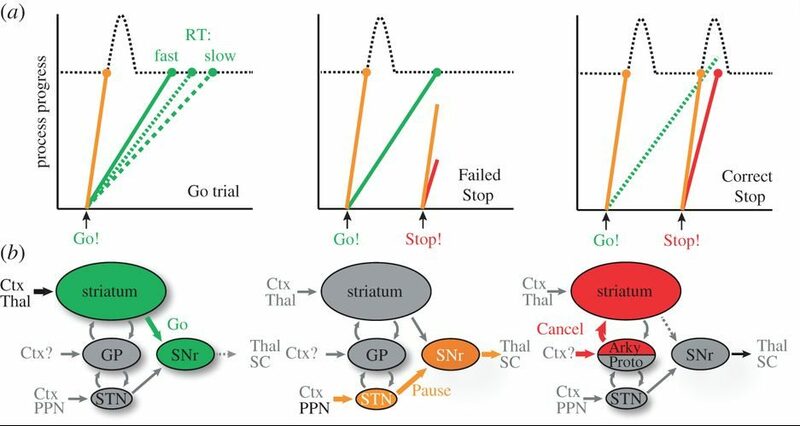 Recordings and computational modeling together indicate that sensorimotor gating of the stop cue arises in the hotspot from the relative timing of two distinct inputs to the substantia nigra: cue-related excitation from the subthalamic nucleus and movement-related inhibition from the striatum (Figure 1). 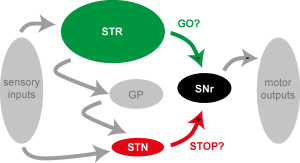 Figure 2: Sketch of the Pause-then-Cancel model of stopping (a) and the involved neural pathways (b). From Mallet et al. (2016) and Schmidt and Berke (2017). One surprising result was that the nigral and subthalamic fast responses often occurred also for the Go cue and were overall very brief (~50ms). Therefore we concluded that these responses are part of an interrupt system that delays movement initiation, but, by itself, may not cancel it. Which other circuits are then involved in making the final decision of whether to stop the initiation of an action? We found evidence that the recently discovered “arkypallidal” neurons in the Globus Pallidus send a stop signal to the striatum (Mallet et al., 2016), inhibiting movement-related activity there. Overall, we have integrated these findings into a novel model of stopping actions (Figure 2; Schmidt and Berke, 2017). In this “Pause-then-Cancel” model stopping is separated into two components: a fast “Pause” component that quickly delays upcoming actions, and a slower “Cancel” component that completes the action suppression.